Hi, I`m Montana. I`m the blue guy there front of all the green budgies. Hi, I`m Dandelion. I am an AVIARY bird. I am not human friendly at all. I am simply part of a flock of 32 budgies who were surrendered when their owner died. We are all generally healthy but we belong in an aviary flock. 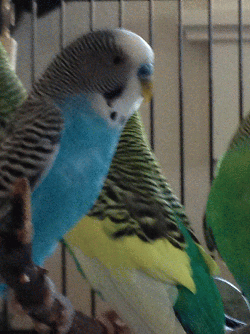 If you have an aviary that`s looking for some budgies, I just might be one of the guys for you!